CUFI UK is paying respect to all British and Commonwealth service men and women from both World Wars, as well as members of British Armed Forces from more recent conflicts, that have fallen in the line of duty. We honour their sacrifice, respect their courage and express our appreciation for defending the freedoms that we treasure so deeply, but are often taken for granted. 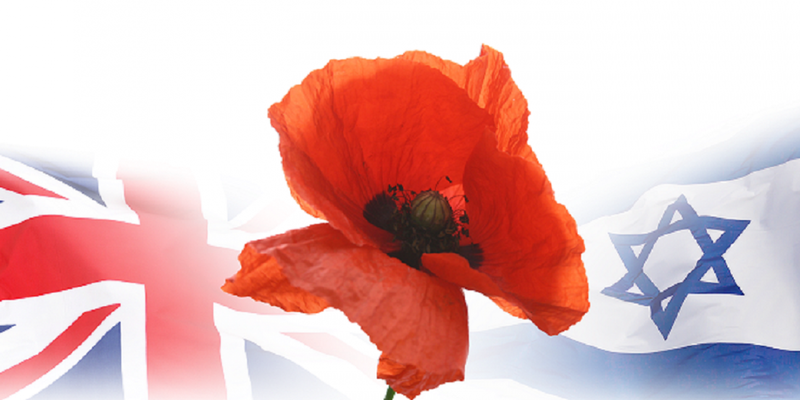 Coinciding with Remembrance Sunday is the 100th Anniversary of World War One, or the Great War. Over 1.1 million British and Commonwealth soldiers were killed, which ranks among the most deadly wars in human history. The conflict cost the lives of a staggering 16 million people. Whilst the major battles that define its horror were all fought in one small stretch of land in northeastern France and western Belgium, historic events were taking place in the Middle East that would transform the geopolitical landscape. On 11 December, 1917, British forces, under the command of General Allenby, liberated the city of Jerusalem after 400 years of Ottoman occupation. It was the final act in a trio of significant historic events that year, the other two being the Balfour Declaration and the victory at the Battle of Beersheva in which British and ANZAC troops drove the Turks and German forces out of the land. The victory would pave the way for the restoration of the land of Israel. We also honour those British soldiers, together with our Allies, that fought in World War Two, who with courage and conviction, rose up against an evil regime intent on destroying our freedom and wiping out the entire Jewish people. The Nazis failed, but only after immense loss of innocent life. The nation of Israel was reborn three years after WW2, not because of the Holocaust, but in spite of it. What seemed impossible became possible. The miraculous rebirth of Israel stands as beacon of hope, a clear demonstration of good overcoming evil and victory out of darkness. The State of Israel exists and thrives today against all odds, whilst being fully aware of what it means to defend the threat to its freedom and values. Israel is prepared to defend itself from those that want it annihilated – and rightly so. That is why we believe Britain must stand with our ally Israel in combating the hatred that rages against our shared values. The attack on these Judeo-Christian values will not win if we remain strong in upholding them and defending them. And this is why at CUFI UK we will be wearing our Poppy with pride this week and on Sunday. It is a poignant symbol to remember those soldiers that paid the ultimate price for our freedom. It isn’t a symbol to be ashamed of. And this is why we encourage you to obtain and wear a Poppy of your own. We will not forget the sacrifice that was made for our liberty. And we will not be complacent in fighting those whose aim is to take it away.